This avant-garde approach to smart home control needs refinement. When is a remote control not a remote control? 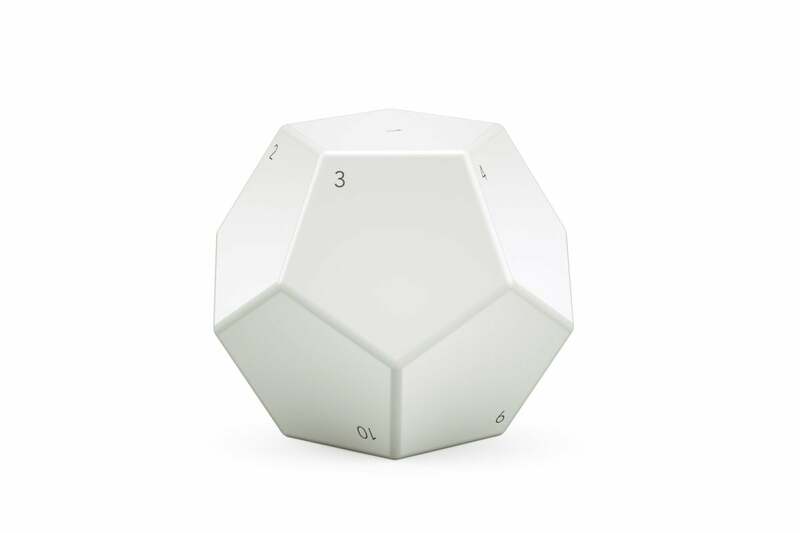 When it’s the Nanoleaf Remote, a new smart home controller disguised as a baseball-sized dodecahedron (that’s a 12-sided figure in non-nerd terms). As control concepts go, the Nanoleaf Remote is decidedly unique. The device has no buttons, just 12 faces, each numbered sequentially. Each face is tied to a smart home control scene (more on this in a bit) via the Nanoleaf app. To activate one of those scenes, you simply turn the remote so that the scene you want is facing up. Place the Remote down on the table, it flashes and buzzes for a quick second, then the scene is activated. Changing to another scene is as simple as rotating the d12 so that another number faces up. 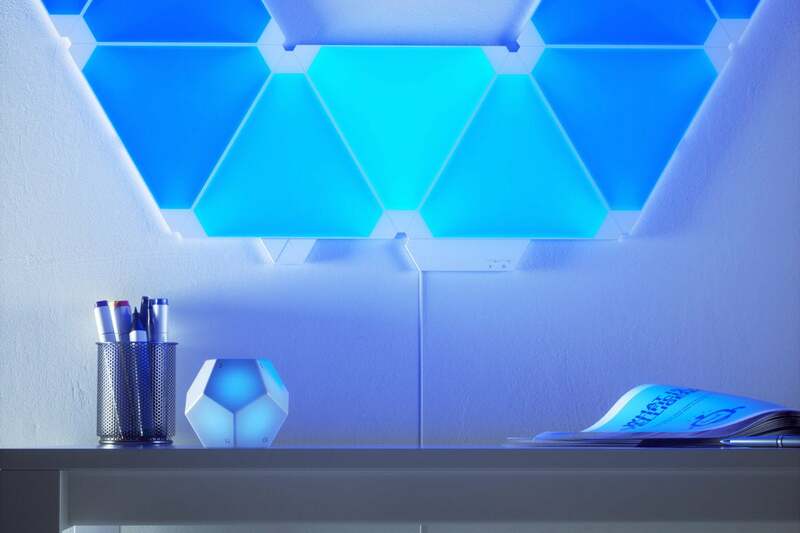 The Nanoleaf is designed for—and works best with—other Nanoleaf products, several of which we’ve reviewed here at TechHive. Most of Nanoleaf’s lighting products are built around groups of panels which can display myriad colors, often cycling through various hues that work to set an overall mood. This d12 is made for controlling, not rolling. While Nanoleaf’s mobile app makes it easy to switch between these scenes, the Remote makes such changes even easier, at least in theory. If you have a Nanoleaf Rhythm, you can even adjust the brightness of your panels by spinning the Remote clockwise or counterclockwise. It’s certainly a more sophisticated way to set the mood than having to fish your smartphone out of your pocket and dig around to find the app you need. That said, while the concept is incredibly cool, the implementation still isn’t quite there. The Nanoleaf Remote requires two AA batteries, which are installed in the core of the device. A flathead screwdriver is required to pry the two halves apart, and you’ll need to locate just the right section to engage with. Inside you’ll also find the QR code you need to pair the Nanoleaf Remote with HomeKit, Apple’s smart-home ecosystem. This process, usually smooth for HomeKit devices, took several tries in my testing, as the process simply failed on multiple tries until, finally and abruptly, I found the Remote was added to my HomeKit environment. The app lets you assign settings to multiple devices through a single face of the Remote. Configuring the remote is a far bigger challenge. The easiest way to do this is through the Nanoleaf app, which has a new tab for the Remote along the bottom of the screen. While Nanoleaf has refined and optimized the color-shifting features of the app, which are used to directly control its lighting products, the Remote feels as though it’s still deep in beta. Fundamentally, the app offers a list of 12 customizable entries, each corresponding to one side of the Remote. Tap the arrow to the right and you can customize what each of those sides do. So far, so good, and while Nanoleaf doesn’t really explain how this works in its whisper of a manual, if you drill down through those right-arrows, you’ll find your light’s settings listed. If your setup is restricted to Nanoleaf products, this won’t be a problem, but things start getting thorny if you want to use the Remote to control non-Nanoleaf devices via HomeKit. 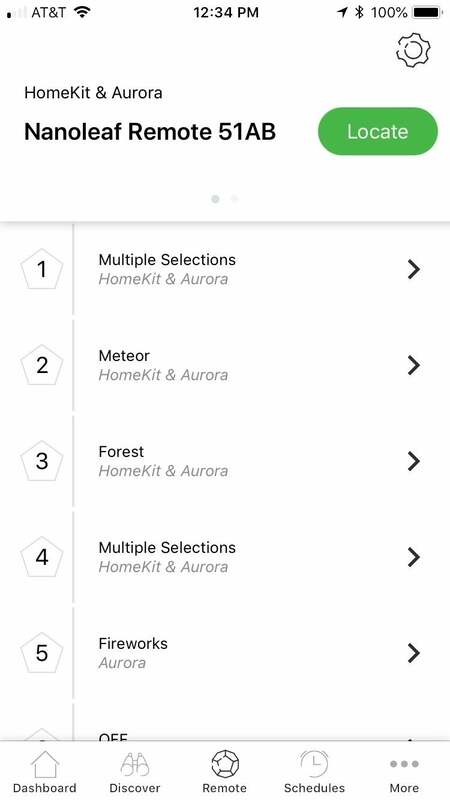 The Nanoleaf app can’t import your other HomeKit devices, so you’re kicked out into the iOS Home app if you want to set those up. 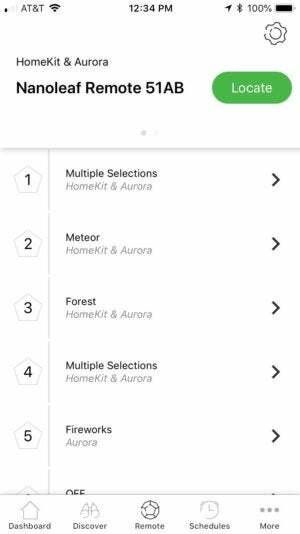 As with most things in the iOS Home app, this is far from intuitive, and it took me a bit of trial and error—since none of this is documented—to configure a Remote face to work reliably with a third-party product. The good news is that a single face can control multiple products (any mix of Nanoleaf and HomeKit gear) simultaneously, but this is even more convoluted. All told, it simply seems like the app and control systems are just not finished, with too little hand-holding and absolutely terrible communication between the iOS Home and Nanoleaf systems. While the Remote itself is one of the greatest smart home conversation pieces to emerge in recent memory, Nanoleaf will need to scrap the app and start from scratch if they want to make it a truly functional one. The hardware element of this smart home controller is ingenious, but the control system is half-baked. Can a d20 be far behind? Think you can remember what all 12 sides do without a cheat sheet?